HOW TANNING AFFECTS YOUR MOUNT. Tanning is the basis for all taxidermy. It is the most important step, from a raw hide to a finished mount. Most taxidermist send there hides off to be professionally tanned, some choose to do it themselves with brush on tans, some will use so called tans that skip almost all the tanning process just to make things easier, and others will use just a dry powder on a raw hide. 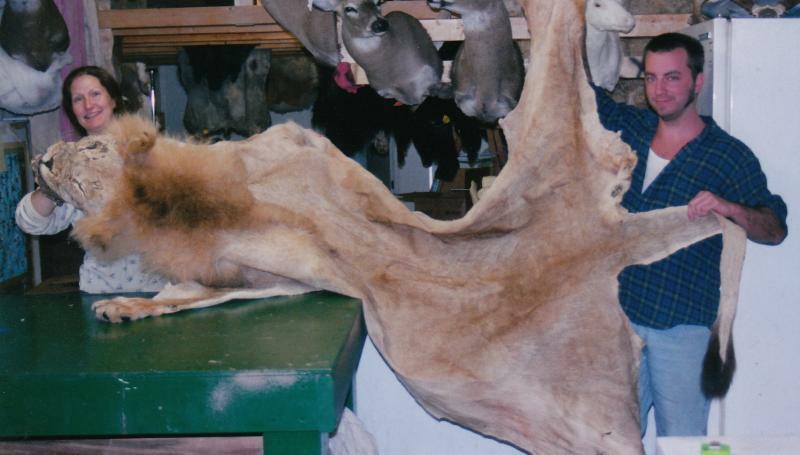 At Sportsmen's Wildlife all skins are tanned in house with Lutan F, the same tan alot of your largest tannery's use. It is one of most expensive method to use, but the finished product speaks for itself. Doing Wholesale tanning on thousands of hides has given Matt the knowledge to give his customers piece of mind when it comes to the care of there trophy. WE DO NOT USE DRY PRESERVE ON ANY DEER OR MAMMAL'S. Matt worked four years full time for a local tannery. Being able to professionaly tan all of his customers hides, gives Matt full control of every aspect of his business.